Spring 2016 is still a few months away, but Dark Horse isn't waiting for the season to make an impact. In May, Dark Horse will deliver the first volume in the prequel to the Blood-C saga from CLAMP, Production I.G and artist Ryo Haduki in Blood-C: Demonic Moonlight. Paying homage to the previous Blood series—but telling a wholly new story—Blood-C: Demonic Moonlight is the prequel readers have been waiting for. In occupied Japan in 1946, an American military investigator is sent to Yokohama Base to research a number of bizarre deaths. His encounters with a mysterious, sword-wielding stranger and a series of supernatural events lead him to believe that the murderer isn’t human. Something more sinister lurks within the shadows! Dark Horse has sold over 70,000 copies of Blood+, a series perfect for fans of horror, suspense and mystery. CLAMP’s contribution to the Blood-C saga continues with Blood-C: Demonic Moonlight, based on CLAMP’s original story line and character designs. Blood-C: Demonic Moonlight Volume 1 is in stores May 11, 2016. Full press release below. The prequel story to the entire Blood-C series! 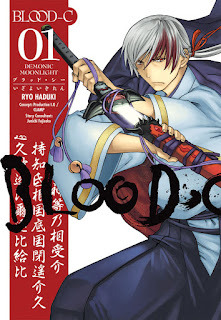 FOR IMMEDIATE RELEASE: MILWAUKIE, OR—In spring 2016, Dark Horse Comics will deliver the first volume in the prequel to the Blood-C saga from CLAMP, Production I.G, and artist Ryo Haduki: Blood-C: Demonic Moonlight! Paying homage to the previous Blood series—but telling a wholly new story—Blood-C: Demonic Moonlight is the prequel readers have been waiting for. Dark Horse has sold over 70,000 copies of Blood+, a series perfect for fans of horror, suspense, and mystery. CLAMP’s contribution to the Blood-C saga continues with Blood-C: Demonic Moonlight, based on CLAMP’s original story line and character designs. CLAMP takes its name from the farmer's term for a heap of potatoes, reflecting their origin as a self-publishing collective of fanzine artists. CLAMP went pro in 1989, and by 1993 there remained four core members: Nanase Ohkawa (main writer), Mokona (chief character designer), and Tsubaki Nekoi and Satsuki Igarashi (artists)--but like a band on different songs, the four often shift their roles depending upon the particular work. CLAMP's early shojo works such as Cardcaptor Sakura and Magic Knight Rayearthattracted the same audience as Sailor Moon, whereas 2001's hit Chobits confirmed their crossover success with male readers as well. More than a dozen of CLAMP's works have been adapted to anime, and collectively their manga have sold over 100 million copies worldwide. The authors live in Tokyo, Japan.